Facebook has launched a new video streaming platform called Watch. 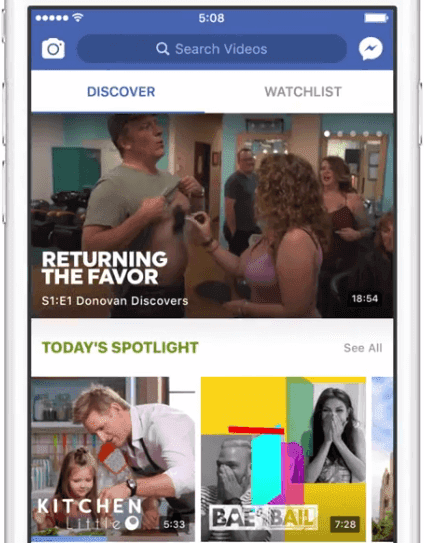 Facebook Watch will contain shows made of episodes; following a consistent theme or story line. Shows will be featured in show pages and users will be able to follow all the shows they love. On Watch, every user has a Watchlist and this is where they find new episodes of the shows they are following. And you don’t need to be online all the time to know the latest. We all know Facebook has the ability to send notifications on just about anything happening around us on Facebook. Depending on what your settings look like, Facebook is able to send notifications to your email address, phone (via sms), or notify you using push notifications on your smartphone about who liked what, comments, friends requests and much more. So in the same way, once you start following a Show, you will be able to get notifications on latest episode added. And once you go online, you will find latest episodes on your Watchlist. Users won’t just watch, users will be able to make comments – start discussions – about the shows they are watching. While watching a show at home, it’s always nice to be able to talk about it with whoever you are watching the show with. On Watch, you will be able to start discussions with friends who are also watching the same show even while the show is live. And shows can be either live or recorded. Now you are not just limited to certain TV shows. Facebook Watch will contain TV shows, movies and even live sporting events taking place anywhere in the world. Watch will be available on Desktop, mobile and TV apps. For now, Watch is only available to a select users and creators in the U.S.
Facebook says it will soon make the Product available to more users in the U.S and to every other apart of the world. I bet you just can’t wait to experience this exciting new entertainment platform. So to stay updated, like our Facebook page or follow @ediarynews on twitter. For publishers and content creators, learn How to become a publisher on Watch. Awesome one!!! Can't wait to start using it.